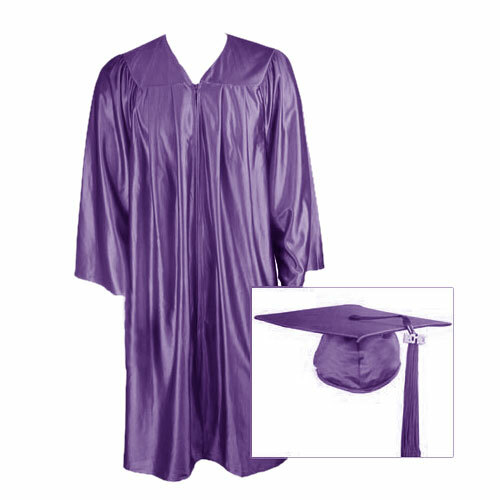 Purple Graduation Cap, Gown and Tassel Please mention Size, color, that you would like to order. FITS : 5`0" to 5`2" FITS : 5`3" to 5`5" FITS : 5`9" to 5`11" FITS : 6`0" to 6`2" FITS : 6`3" to 6`5"
Customer Reviews on "Purple Graduation Cap, Gown and Tassel"
I wanted to make my honor students feel special so i decided to order Caps Gowns for them. This product was of great quality and made my honor students feel special. I cant wait for next year so i can order again. Our school was very happy with our purchase. Found out last minute I had to order an Caps Gowns for my college graduation, which is June 10. Placed the order late amazingly received within 2 days. I'm graduating from University of Houston. The Caps Gowns I ordered is the PERFECT color, and the perfect length. Nice quality as well. Thank you so much for giving our honor students an added touch of elegance to their graduation attire. We purchased your Caps Gowns and couldn't have been happier. We wanted a special way to make our honor students really stand out from the other students. Since we had such a large graduating class, your Caps Gowns, so shiny and bright, made our honor students easy to pick out in the crowd. Our school was very happy with our purchase. Looks great! Great price. I received the Caps Gowns in one day. If your looking for quality, this is a great buy! Ordering the product was easy and straight forward and I received the Caps Gowns within a 2 days and they looked really good. Write you own review on "Purple Graduation Cap, Gown and Tassel"